You’d never know I’ve hauled about 10 bags of stuff to the trash, but I have. It’s a slog, but I will get this done! I want to get the floor emptied and the compact discs boxed and put with the rest of the CDs. That’s a whole ‘nother project, so putting them all together in one place and dealing with them is the smartest thing I can do. 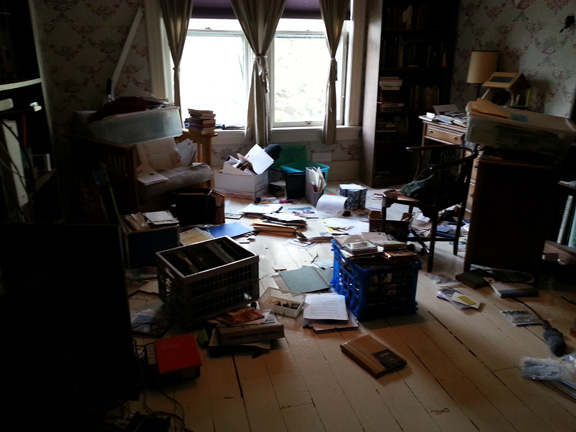 After the floor is relatively clear, I’m going to tackle the note cards. Mom had a lifetime supply of stationery and it’s taking up two full shelves in that room. I will never write that many notes. And if I do, I need to remember that even if civilization is eroding, it hasn’t slipped to the point where I can’t buy pads, paper and note cards. Also, I have a job and can afford to pay the utilities, so we are not at the point where I need to burn what Mom didn’t use to keep warm. Speaking of which, she was very pleased with the blueberry drop-off and is even more excited that my sister, the Disneyland Daughter (the one who comes around a few times a year and takes her out for lunch and shops and does fun things) is coming tonight. So I will have to take a bit of time off to get her room ready, and I want to clean the bathroom. But my little den is top priority, hard as it’s been to do what I’m doing. Also, Sweetheart is home today. He says he’s going to deal with laundry and the upstairs hallway (you don’t want to know). Truth: If I manage to get out of my way and ruthlessly excavate, the rewards will be worth the angst.